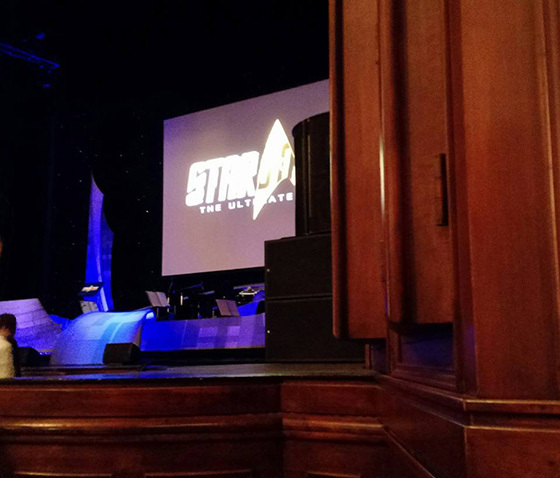 Star Trek: The Ultimate Voyage celebrates the 50th anniversary of the iconic franchise with a live orchestra accompanying scenes and collages from the show's five television series and motion picture spin-offs. We saw the show at the Benedum Center in Pittsburgh on March 1. Upon being seated, we discovered our "prime orchestra seats" left a bit to be desired. Fortunately, there were unsold seats in our row and we were able to shift over to get a somewhat less obstructed view. Still, one would hope the stage crew would have done a somewhat better job of making certain the sightlines were clear. The orchestra was composed of members of the Czech National Symphony Orchestra, and they provided an enthusiastic performance that was technically perfect. There are YouTube clips of the show's Royal Albert Hall engagement performed by the famed London Philharmonic Orchestra, and one features the trumpets flubbing (about 20 seconds into the clip) the main fanfare of Jerry Goldsmith's Klingon Battle from Star Trek: The Motion Picture. The musicans at the Pittsburgh show nailed it, as well as the other challenging arrangements performed during the evening. Which brings me to my major gripe about this show- and for that matter, the touring companies of most Broadway musicals: not enough musicians. While billed as a "full symphony orchestra," there were just 30 musicians on stage. That's less than the number contained in a typical chamber orchestra, and about a third of the size of a full symphony orchestra. Hell, when Paul Shaffer contracted the orchestra for Jimmy Webb's MacArthur Park for a performance on Late Night with David Letterman, he used 33 musicians. This is false advertising in some respects. The concert's own promotional "Tour B-Roll" shows a much larger orchestra, with double the number of horns that were at the Pittsburgh show. This is an issue because the Trek scores, particularly the ones composed by James Horner, require a robust horn section. Horner used a 91 piece orchestra for Star Trek II: The Wrath of Khan, with an augmented French horn section containing eight members. Other instruments, like piano and harp, just weren't there. Most people won't miss the opening harp glissando of the Next Generation theme, but its absence is noticeable for those who are familiar with the music. The touring company only had two French horns in its seven-piece brass section, and the horns were often buried to a degree by the strings. The production compensated for this by miking the orchestra and adding them to the recorded dialogue and sound effects from the accompanying video clips, which were sent to the show's own sound system (see photo). While effective, it sort of negated the point of the experience. If I wanted to hear the Trek scores through a speaker system, I could have stayed at home. From time to time the orchestra itself could be heard over the speakers, but it was nonetheless somewhat disappointing. The video accompanying the music consisted of either full scenes from episodes of various series, or a collection of "themed" clips from the movies and television shows. It was tied together by a frankly vapid, inane, cliché-ridden narration that was immediately forgettable. The clips were high quality. Those from the fifty-year-old original series used the recent CBS digital remasters, and they held up remarkably well on the 40-foot screen. My favorite sequence was "Kirk Does It Again," composer Sol Kaplan's strident score as Kirk works to destroy The Doomsday Machine. That the two trumpets had any lip left after this performance is amazing. If you have a chance to see this show, go for it. My criticism is that of a hypercritical Trek score afficianado. During intermission (or "half time," as the guys behind us called it- remember, this is Pittsburgh) the overheard audience praise of the performance was effusive, with one young lady saying she had been moved to tears. And despite my criticism, I'd see it again.